During the Middle Ages the idea of splendor and light was extremely important in material creative expression. Very rich vocabulary was used to describe light in art theory and in theology. Colors were seen as a part of symbolic expression, they were not supposed so much to imitate nature, as it happened later, during the Renaissance, but the goal of using colors was to express an ideal reality. Therefore was not much interest in showing shadow in art, but a lot of interest in showing the most possible clarity in colors. Paints were even mixed such way that they stayed as close as possible to the ideal hue of the best of pigments. And beauty was a representation of some kind of ideal reality, was it luxury of secular art, or visionary and also luxurious world of religious art. This ideal reality was thought to exist in colors, and colors had, in opinions of medieval people, their own inner light. This thinking about the ideal essences of things was the legacy of the Classics, of Plato and than of Plotinus. I hope not to make things too complicated, but symbolism, philosophy, iconography, mysticism, theology, and technicalities of making art were all interconnected. Medieval art put extreme emphasis on purity of colors. When digging deeper in art history we will see that there were some differences between Latin Christianity and the Byzantine Christianity, but in general color ruled the art world. Raw pigments, powdered metal. Yes, I prepare some of my paint from time to time, like in old days. You see here the four most important colors of the Middle Ages. Yes, gold was considered a color, unlike today. Speaking of hues, we have almost primary colors, red, blue and yellow, as gold is close to yellow, and was replaced by cheaper yellow sometimes. Plus a neutral: white. 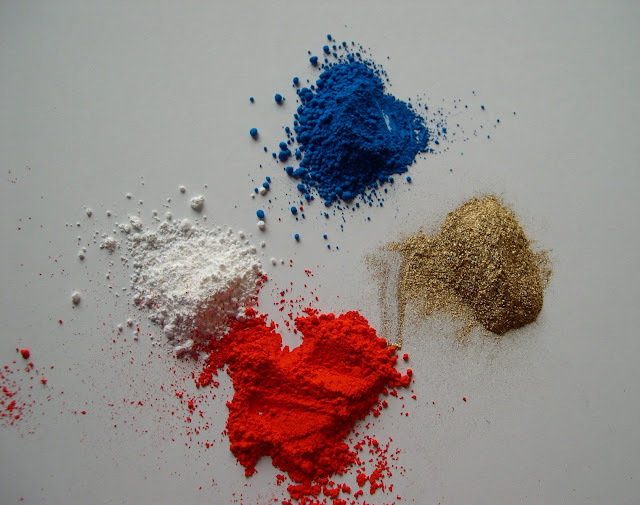 I start this part with two of those powders on the picture, (one raw pigment, one metal powder), which were relating to light: white and gold. White: symbolized light, also in theology which influenced art. White was a symbol of purity, innocence and renewal of spiritual life. During the early Middle Ages angles were shown as white, but later were colorful. It truly depends on time and place: later Middle Ages had colorful angels. Also the elders of Apocalypse, robes of Jesus, prophets, newly baptized people, considered innocent, the righteous people, Jesus in moment of transfiguration. But Jesus was not always shown in transfiguration in white robes only, Middle Ages had codified symbolism, but not rigid rules. 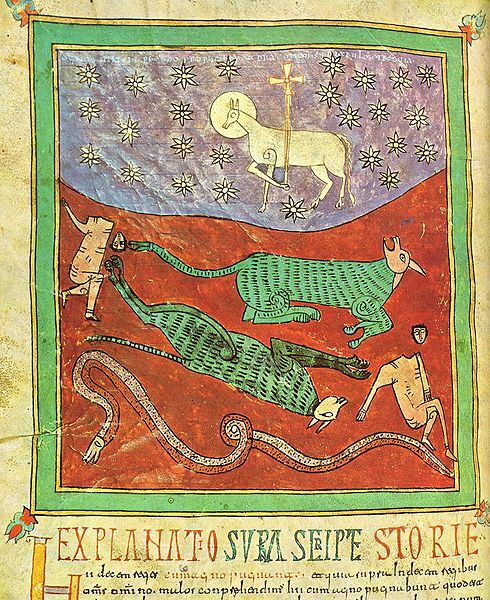 This example shows white as light (stars), and as a symbol of innate purity as seen in this white lamb from St. Sever Apocalypse manuscript. Gold: as white was more representing physical light in the world, and also had symbolic meaning, the divine light was gold. The light reflecting properties were used freely, not only for decorative purposes but also to communicate theological truth, to show light out of this world. As the divine light was closely relating to the idea of absolute divine wisdom which it represented, the backgrounds of paintings and mosaics are golden. But not always, blue was used too. Gold symbolizing divine light represented spiritual illumination, and to indicate this state of blessedness, connection to the divine, or divinity itself. Halos were golden most of the time. But also there were halos painted blue. Here is the link to Hagia Sophia interior video. for those of you on whose search engines videos embedded in this blog do not show.Hagia Sophia means the Holy Wisdom in Greek, and it was the most magnificent church in the Constantinople, the capital of the Byzantine Empire. Usage of gold is befitting the name of the church very well. Red was color of love in sense of selfless love, like Christ's love fro humanity, agape which is the unconditional love, and blood of redemption and blood of martyrs. Blue was symbol of heaven,contemplation, things which are divine, life lived in accordance to the highest standards. More about those colors later. We need to keep in mind that system of color symbol was not rigid. There were canons in iconography, but it doesn't mean that the artists were slavishly following them. The philosophers and theologians were interpreting colors quite freely as well, a lot of abstract thinking went into writings about colors. Does it means we can't rely at all on color symbolism in Medieval art? Yes, we can. But we should approach it with open mind, and remember that there are no absolutes. Also the symbolic language of colors in religious art was adopted by secular art, but the meaning of one color in religious art many not be exact the same in secular art. For example white was worn by French queens as the color of mourning. Purple was color of mourning too, in addition of symbolizing royal, or imperial power. A very informative article about color http://renaissanceclothing.blogspot.com/2011/02/meaning-of-renaissance-and-medieval.html in Renaissance and Medieval clothing. Not only is the author very well informed, but also gives warning not to interpret things too rigidly.